Titanite (Sphene) has a fantastic strong fire, a dispersion higher than that of diamond. It is a soft and brittle stone so seldom used in jewellery. It comes in greens and browns and there is also a rare colour change variety. It is a strongly pleochroic stone, with a very high birefringence and an adamantine lustre. Titanite (Sphene) is yellow/brown and grey and has cross like extrusions. It represents the four elements and joining of spirit with earth / matter. Spirituality, compassion, letting go, unattachment. It focuses and centres you on the here and now. 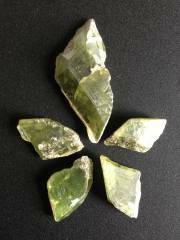 Titanite (Sphene) is associated with the zodiac signs Virgo and Libra . Titanite (Sphene) activates all the chakras. A bright green gemmy sphene crystal. Also known as sphene.